All I have to say. I think I read this first. I looked at here: Nothing new. Left, made a post on a different forum, came back and this was here..
Something about this makes me happy.. I think it's the thought of more Rockman games. Meaning new series? Or a different, existing series going into 16-bit? If it's gonna be an already existing series then I say X into 16-bit. I wants me some EXE back. I'm sick of RnR. "But most of them are what fans have requested of us. And we try to make follow-ups to the games that fans request. " If that's the case, then where's Mega Man Legends 3? There have been TONS of requests for it over the years, seriously. And I doubt that little Japan-exclusive cellphone game counts. The fan request thing is pure bull xD There are so many EXE fans and we still don't see a EXE for DS with WiFi now do we? Also, a 16 Bit game would be nice. Personally, I don't mind RnR, in fact, I love it, but I would love to see a WiFi version of EXE. Would they bother making another X? If you think about it, the classic series had its first six games on the NES. Then there was one 16-bit one, and two 32-bit ones (R&F was made to look like MM8). The X series, on the other hand, only had its first three games in 16-bit, then 3 32-bit games, then two games in 3D. It doesn't have the same nostalgic power that the classic series has. So I've gotta wonder. Will they bother to make another X game? And if they did, what style would they go with? I have a feeling that if they went with 16-bit, Axl would be "conveniently" forgotten >.>;; (I mean, is Bass even in MM9?) I imagine the thought of that makes some fans happy, but I'm actually pretty fond of him. Somehow they made him fit in the story. To be honest, I just want another X series game. I don't care if it's 16-bit, 32-bit, or in 3D. I just want more wall-jumping action (seeing as how we probably won't get a ZX3). The classic series always annoyed me with the "get to the next ladder or screen transition" stage layouts. And hopefully a 32-bit MM10 or something along those lines. "And we try to make follow-ups to the games that fans request." 1. In case you haven't figured it out by now, you're a good 10 years late with MegaMan 9. Maybe if we all spam capcom of Japan's email. I've waded through google-translated pages and done it twice. And I got a nice little response twice. 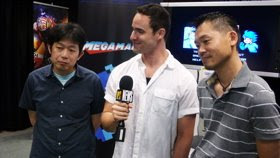 :D They seemed pretty open about reviving the EXE series, even though I didn't ask the question straight out. Can you say, "Email your congressma-- er, Capcom of Japan day?" Really? A new EXE would rock! I hope he can redone Rockman 7 and 8 into 8 bit first to make all megaman series 1-9 8bits more sense then 16bit or 32 bit.